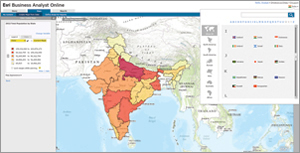 The Advanced database for India contains data on more than 80 attributes at the Subdistricts, Districts, States, and Country geography levels. This map shows medical spending by district. In December 2014, data for 57 more countries, including Latin America and Africa, was added to Esri Demographics global data. Each dataset is available across the ArcGIS platform in a variety of ways including ready-to-use maps and detailed reports. These datasets can also be exported in a file using GeoEnrichment services and combined with other data in a spreadsheet. The data is also available on ArcGIS Online and via apps such as Esri Maps, Esri Business Analyst Online, Esri Community Analyst, and Esri Insights. The Canadian data was also updated to include the 2014 demographic updates. Three Advanced databases for Germany, India, and Australia offer more detailed attributes at lower geography levels and complement the data for these countries that is already available on the ArcGIS platform. The Advanced database for Germany contains detailed data on age, purchasing power, ancestry, household size, tenure, lifestyle, vehicles available, and summarized business data—more than 400 attributes. This database is available at the Neighborhoods, Municipalities, Counties, and States geography levels. The data is available on the ArcGIS platform, through the GeoEnrichment services and in some web maps on ArcGIS Online. The Advanced database for India contains data on age, employment, and caste and detailed data on housing, sources of drinking water, lighting, cooking, and latrine facilities. More than 80 attributes are included in this 2012 database at the Subdistricts, Districts, States, and Country geography levels. The database contains detailed data on age, marital status, country of birth, language, religious affiliation, educational attainment, income, family composition, occupations, and dwelling structures. You can also access a selection of demographic web maps for Australia on ArcGIS Online. Summary reports for Household and Population for Australia. Summary reports for Business, Housing, and Household and Population for France. Summary reports for Business and Retail Centrality, Households, and Population for Germany. The Demographic Summary report for India. For more information on accessing Esri Demographics global data, call 1-800-447-9778.